The story of Gâteau Basque, time alone, and friends to share it with. I will admit that the quietness of my house is good for me once in a while. It was only periodically interrupted by long talks with my Husband, which felt good and strangely adult. With no schedule to keep I felt like I was on vacation. Really my home is like a vacation to me; most of the time there is nowhere else I'd rather be. Amidst the organizing and some deep cleaning, a shift worked at the cafe and gentle, simple dinners, my new boss/friend and I decided that my being childless was a good excuse to have a collaborative dinner. She was bringing some pork that she had butchered in a class and had stashed in her freezer, and I was in charge of bread, dessert, and veggies. Her sister (/co-worker/neighbor) and I all sat together on the patio last night after our delicious dinner trying to pronounce "gâteau", which I thought ended up sounding more like the Spanish "gato". But, the pronunciation doesn't matter much with this homey, easy dessert. 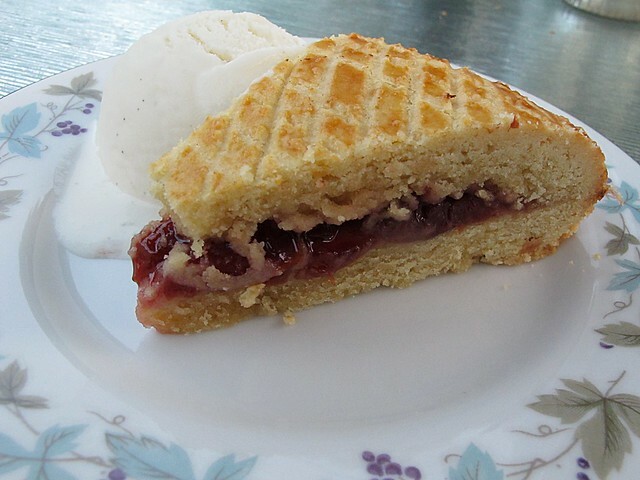 Filled with last years tart cherry jam, I felt relieved that I had gone with a Dorie Greenspan recipe when trying to impress a chef-friend. It bears mentioning that any recipe Dorie Greenspan has ever written will turn out for me on the first try, no questions asked, making her one of my secret weapons when I am trying to make an impression. Gâteau is exactly the thing to make for simple dinner parties. It is lovely and French, it can be filled with whatever preserve on your shelf you need to show off or use up, and it isn't so big that you find yourself with enormous amounts of leftovers to contend with. It could be my new favorite dessert. Truth told, I am insanely insecure about cooking and entertaining for others, even more so when one guest is a professional. 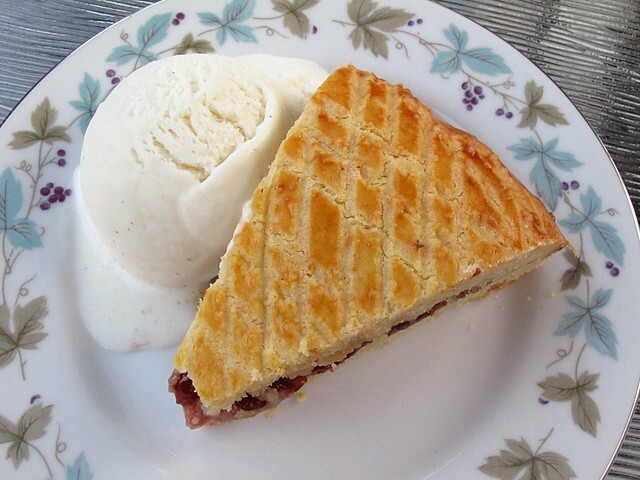 I re-washed all my silverware and towel dried the spots off of them, I re-folded all of the mismatched napkins to approximate the same size, I baked the gâteau at the last moment - when it had enough time to cool to room temperature, but not enough time to be called "old". The batter, which is really more of a dough or a cross between a batter and a dough, is rolled out into circles between plastic wrap, and then chilled for at least 3 hours and up to 3 days. Baking time is just over 45 minutes, allowing one to get herself cleaned up and presentable for company. Like I said, the perfect dessert for easy entertaining. Whisk together the flour, baking powder, and salt in a small bowl. In the bowl of a stand mixer fitted with paddle attachment (or in a bowl with a handheld mixer), beat the butter with both sugars for 3 minutes, or until the butter is smooth and the sugar has started to dissolve. Add the egg, and beat for 2 more minutes. Scrape down the sides at least once, and the batter may look curdled, but this is normal. Reduce the speed to low, add the vanilla extract, and then add the dry ingredients in 2 or 3 additions, beating only until they are fully incorporated. Divide the dough into 2 equal portions (yes, I weighed them), and form each into a circular disk. Working with one at a time, roll the dough out into a circle between two sheets of plastic wrap. Be sure that the circles will fit into your pan. I used my 7 inch springform pan, and used the base as a measure. Still in the plastic wrap, stack the disks on a flat plate and refrigerate at least 3 hours and up to 3 days. When ready to bake, preheat the oven to 350 degrees and generously butter your baking pan (I used salted butter for this, just because). Remove the disks from the fridge, and let them sit for a few minutes at room temperature before peeling back the plastic wrap. Fit one disk into the prepared pan, and spoon the jam evenly on it, leaving a 1 inch border. Moisten the border with water, and place the other disk on top. Press gently, trying not to let too much jam escape the sides. Some jam will escape anyway - and this is okay. Make an eggwash by beating an egg with a splash of water and brushing it over the top. (Reserve the beaten egg for tomorrow's breakfast.) 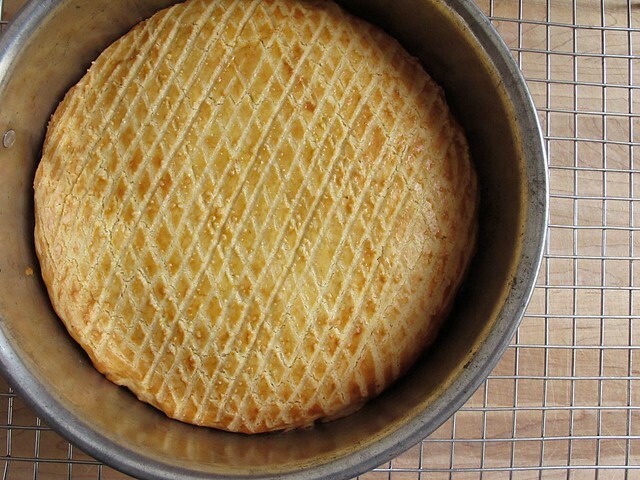 Make an even crosshatch pattern with the tines of a fork, and the bake on the center rack of the preheated oven for 45 minutes or so until the top is golden brown. 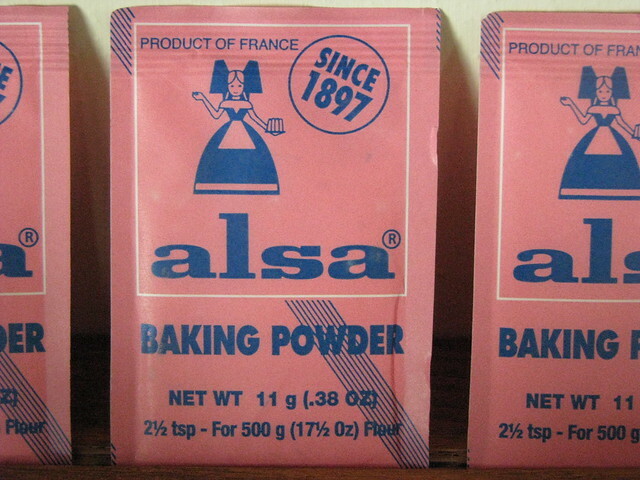 What seems like a long time ago, I found packets of French baking powder in an Asian grocery that I bought because I loved the packaging. They were sold in cellophane, maybe 6 packets to the pouch. I couldn't wait to get home and Google to find out about it. What I remember is that it is single-action baking powder, powder that activates immediately when it hits liquid and not again when it hits the oven heat. I recall that it was recommended to be used in gâteau, though I'm not certain how it would fare with a long refrigeration time. I may try it sometime, I still have the pale pink packets in my baking pantry. They still make me happy when I see them in there. So my vacation week is ended, my kiddo is on his way home, and I have just a few hours more of a quiet home. I am looking forward to hearing about all of his adventures away (especially because my Mom told me that he was eating all kinds of new foods this week), and I look forward to having my little family all together once again. I have a few pieces of gâteau left for everyone to taste after dinner tonight, and I will see how long the pretty little cake remains tasty.